As is the case with the majority of careers with animals, an Equine Veterinary Nurse has no such thing as a typical day. 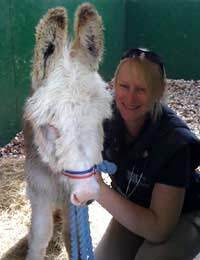 Nina is an Equine Veterinary Nurse with a ‘horsey background’ and total commitment to all things equestrian. She started riding when she was 5 years old and has rarely been far away from a horse since! After years of working as an instructor and professional groom-and with some serious deliberation about what to concentrate on in her future-Nina began training as an EVN under the RCVS. Some student nurses have little previous knowledge or experience of working with horses; but have already worked as small animal veterinary nurses. Staff rotas vary considerably between Equine Veterinary Clinics. It is not uncommon to be on call for 1 in 3 (or 4) days and 1 in 3 (or 4) weekends. Nine hours is the average length of a EVNs working day, plus overtime; which varies with the number of in-patient emergency cases. Professional cover is 24 hours a day in this field. At the start of every shift use SOAP! Subjective assessment -does the horse look comfortable and is it responsive? Objective assessment -TPR (Temperature, Pulse, Respiration) recorded, checked with previous shift records. Action -drugs administered in appropriate cases. Planning -next 24hrs care and treatment planned. Once a patient has been taken to the operating area it is lead into the induction box (a heavily padded room) where it is ‘knocked out’ under general anaesthetic. The EVN assists an anaesthetist. When the animal is fast asleep, the legs are hobbled and a hoist is used to position the horse on the operating table. There are two different EVN roles in theatre. A circulating nurse is not in direct contact with the horse or the operation underway. His or her role is to pass bandages etc and assist the anaesthetist. The scrub nurse assists the surgeon throughout an operation. Following a surgical procedure, the horse is closely monitored in a specially equipped recovery box. It is later lead back to a stable and re-introduced to food, as appropriate, and regular observations of progress taken. The EVN will clean, disinfect and sterilise all areas and instruments in preparation for the next operation. Horses are trotted up under observation for diagnosis of lameness. EVNs are also involved in the preparation of nerve blocks, scoping, x-rays, laboratory work and sample processing. Surgical kits and consumables are prepared for the duty Equine Veterinarians off-site cases. At establishments with an ICU (Intensive Care Unit) an EVN may spend the entire duty time monitoring and vet nursing sick foals, for instance, or caring for animals in isolation. Efficient record keeping and paperwork, plus the ability to work as part of a close-knit multi-disciplinary team is very important in order to ensure continuous standards of care for all patients. Committed people only need apply!